← Jin’do must die. Or Hakkar must be unchained. Something like that. He’s such a winner, maybe he’s Charlie Sheen. Oh right, Charlie Sheen is a Warlock. I would be fibbing if I said that it was the game itself behind the reason that I left the game but essentially it is people like that too. For every amazing person I love in WOW there are 2 terrible people making the ratio just un-fun and upsetting. I am the Bee Pit’s biggest fan. Is that a bad thing? As dps I almost never leave a pug because of the long queue time. Last night I left 2 because of tanks with bad attitudes. And they get presents on top of it all. I love rewarding bad behavior. I don’t remember the exact words. I do remember that I was met with DEAD SILENCE. From everyone. I probably would have tolerated finishing the instance with the tank, bastage as he was, out of courtesy for the DPS, if the DPS had paid me the slightest attention. I don’t blame you for leaving. I try to help out where I can to make up for overinflated ego tanktards. I am starting to wonder whether bees are really a severe enough punishment for idiots like this one. We grow some seriously epic scorpions out here in the boonies of West Africa – might I convince you to repopulate the Pit with them instead? Ooooh! I’ve got one for ya! Setting: Throne of the Tides. Sequence of events: DL goes ‘Hey, wait up a minute’ and begins marking CC, as this pack in particular has 3 melee, 2 casters. Not healers, casters. The kind with chain lightning, right? So he gets one mark up(moon, we had a mage, which means sheep, right?) and then the tank charges in. I manage to get a hex tossed on the other caster.. which is promptly broken by AoE. The two casters then proceed to chain lightning through the group, causing a wipe. 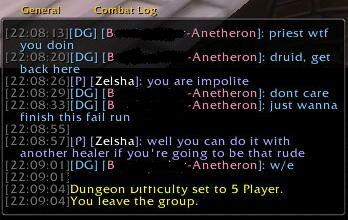 I(the healer) am promptly kicked, because it was completely and utterly my failure fault for not being able to out heal two casters in a heroic spamming chain lightning at will through the group. Into the bee pit, the lot of them. Of course it was your fault, right?